Before reading this third and final installment of this mini-series, catch up by reading part one (here) and part two (here). I’ve spent the last two days painting a picture; an illustration of how I perceive the local fight scene in its current state. While my imagery has been described as negative in that I attest the fight scene is in a heavy decline, I will offer praise where it belongs. I acknowledge that a promotion like King of the Cage is still thriving in a declining market, still filling up their venues and providing not only opportunities for amateur and professional fighters alike, but continuing to produce a quality product that still entices the fight fans to come out to their shows. I also acknowledge that their are smaller promotions around New Mexico grinding in their own ways as they promote events periodically throughout the year. I could go into the issue I have with the poor fight promotion displayed over the years that has played a small role in the decline of the fight scene but today isn’t the right time for that. Instead, we will continue to talk about Sanchez/Sanchez III. We talked about the backstory. We covered the epic second battle in detail. I think we only have one thing left to discuss…. how the trilogy could happen and if it did, how should it go down. The career of Angelo Sanchez would see plenty of opportunity. Aside from his reign as KOTC Champion, Angelo would go on to fight for Bellator MMA. First things first. You can’t have a fight without a venue and often the location of an event will really set the theme for fight promotion and act as an introduction for fight fans. In a perfect world, you would hope for venues like The Pit or the Santa Ana Star Center to host such an iconic fight. This isn’t that world and if history proves to be consistent, shows who bite off more they can chew often fail badly. Bottom line, if you book a major venue and don’t sell a significant percentage of the seats – it is going to look terrible in there. The crowd’s mood will never peak and you will lose out on those moments where a crowd roaring makes the experience go from a good time to giving fans “chills” as they feel the vibration of the cheers. But you don’t want to undersell yourself either. It would be bad business to book too small of a venue and lose out on ticket sales once the small venue sells out. I don’t think venue size should be the top priority, we have to consider the historical value of this rivalry. The previous two fights were held at the same location. One of the most beautiful venues in New Mexico, not just for combat sports, but in general. If no obstacles existed, the perfect location for the trilogy would be the Inn of the Mountain Gods Casino & Resort in Mescalero, New Mexico. Whether you are in Mescalero or Ruidoso, you are in a place that embodies the beauty of the State. It was also the host venue for countless mixed martial art events and notable fights, match-ups, and moments. Add this to the mix and you cement the legacy of the two fighters who could finish this story’s final chapter within the confines of where it all started over seven years ago. With a venue booked, we may have overlooked one key component. Who would be promoting this fight? Keeping consistent with our historical approach it would only make sense to have all three fights happen under the King of the Cage banner. It may be asking too much to have a title on the line but it wouldn’t be right to have the third bout anywhere other than the familiar yellow-themed KOTC cage. 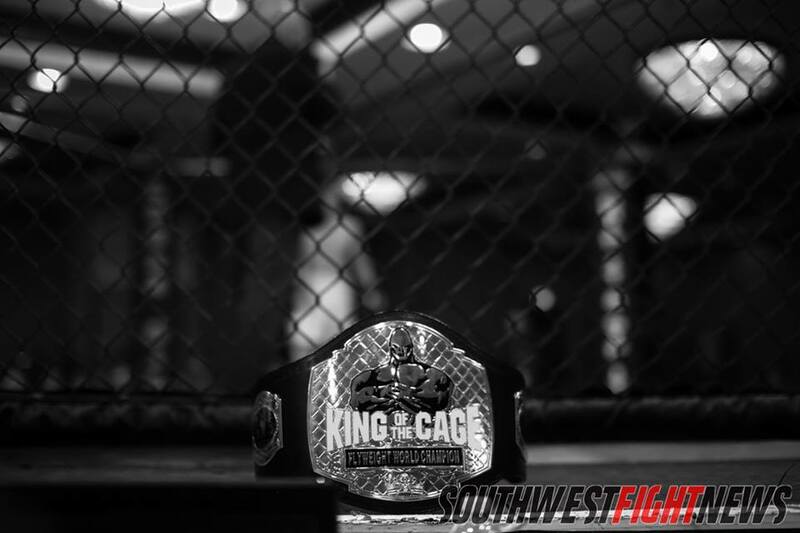 King of the Cage has been the platform for many up-and-coming fighters, and the title has been wrapped around the waste of some of New Mexico’s best fighters. It would definitely instill nostalgia to see either Sanchez headlining a King of the Cage fight card being that the two were essentially fixtures of the company years ago and remain arguably two of the promotion’s most prolific athletes. King of the Cage. Help me out with a KOTC-esque event name. “Titality”. “Finality”. “Final Chapter”. One final piece of the puzzle remains. How do you promote the fight? How is the match-up sold to the fight fans? We can’t expect nostalgia to sell the place out. Even the best of fight posters won’t do it. Your typical media plugs haven’t been moving the needle recently. You grow this organically. Tell the story and allow the fans to become engaged. There was a promotion a couple of years ago, I would rather keep it nameless, that did a fairly good job with video promos. I wouldn’t say the videos were all that impressive but it was more the idea behind them. For this fight, you shoot videos for both fighters and you let them tell the story of when they first crossed paths. The first time they signed contracts to fight each other with the title on the line – Angelo, the challenger looking to make a name for himself, Donald, the Champion who had his eye on fighting the best talent MMA had to offer. Using another nameless promotion’s idea, you set-up press conferences. But you don’t set them up in the middle-of-nowhere or during a traditional work day during working hours. Sure that caters to the fair-weather media teams of newspapers and television shows, but their coverage is so poor it isn’t a wonder why fans aren’t as engaged. You set-up press conferences at a time friendly for the fans. Allow them to experience the interview process instead of watching the same old generic interviews on their phones. I don’t think I have been to a press conference, Holm fights included, that have more than a dozen people in attendance that aren’t there as part of one of the fighter’s team. The beauty of this match-up is there is real passion between these two fighters. You won’t need trash-talk. You don’t need either fighter to put the other down. All that is needed is for both fighters to speak candidly about their rivalry and this story sells itself. This is what MMA is. 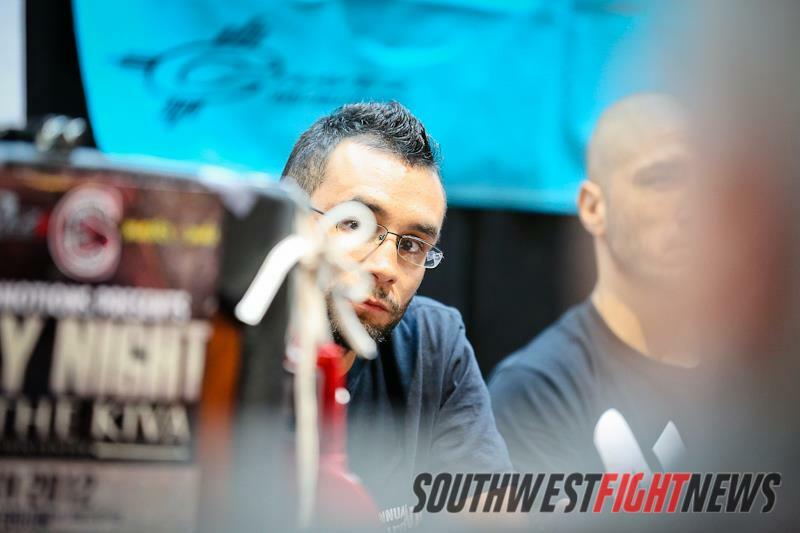 This is the very foundation of what the sport was built upon; not just in general terms of MMA, but in New Mexico’s rich culture of combat sports, Donald and Angelo represent and exemplify they very essence of this sport. They are martial artists, with strengths in a mixed bag of disciplines from boxing to Muay Thai, and Jiu-Jitsu to wrestling. A winner in this fight cements a legacy in terms of the trilogy but it raises both fighters to a pedestal that not many local athletes could ever attest too. These guys are legends. They helped pave the way for this sport to thrive in this area through their blood, sweat, and tears. 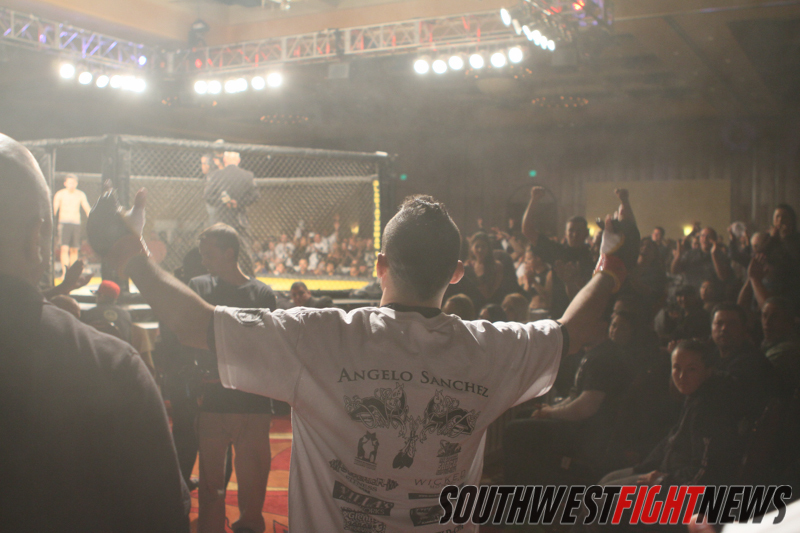 Angelo Sanchez as he enters the cage to face Jacob Clark. Anyone who has seen a live fight of either Sanchez knows how live the crowd gets from entrance to hand-raise. Last I heard, Angelo was retired from active competition but his social media page not too long ago seemed to tease a comeback. Donald on the other hand in active, however, he has signed a lucrative deal to fight in Russia where he very well could end his career should he see the end of his newly-signed contract. So maybe this fight is far-fetched, maybe just a dream scenario. But maybe we don’t need Angelo and Donald to actually touch gloves in the middle of the cage. Maybe what we need is the spirit that the two fighter’s carry with them as they walk to the cage. A fiery passion. A drive for competitive greatness. To wrap up three long days of this story – we need heart. Don’t take that as me saying our fight scene is absent of heart because we do have so many talented athletes grinding every day to make it. It just isn’t the same. Angelo and Donald, they are rare commodities. Much like Ray Borg, John Dodson, and even a fighter like Gerald Lovato – they just had something different. For a Lovato, it was the fighter look. A fighter like Borg, it was the special talent you could see in his amateur days. There was just something special there. Something only a few seem to possess. A buzz. The ability to make a tremendous impact, transcend further than the average athlete. Hopefully one day, in the near future, fight fans have the chance to see Angelo and Donald lace up their gloves again in New Mexico regardless if it is against the other. And if it doesn’t happen, let’s make sure that we do our jobs as fans to never forget the rivalry. Let’s pass down the video of the second fight, re-tell the legend of each fighter’s career, and instill in our fandom that we appreciate the passion and drive that these fighters possess as they put their bodies and health on the line to entertainment the combat sports community. So what do you think fight fans? Give us your thoughts on our three-day series. Let us know how you feel about the match-up, what up-and-coming fighters you think could make waves, and what your take is on the state of local MMA in New Mexico.